With a name like that how could you not want to explore along this path? 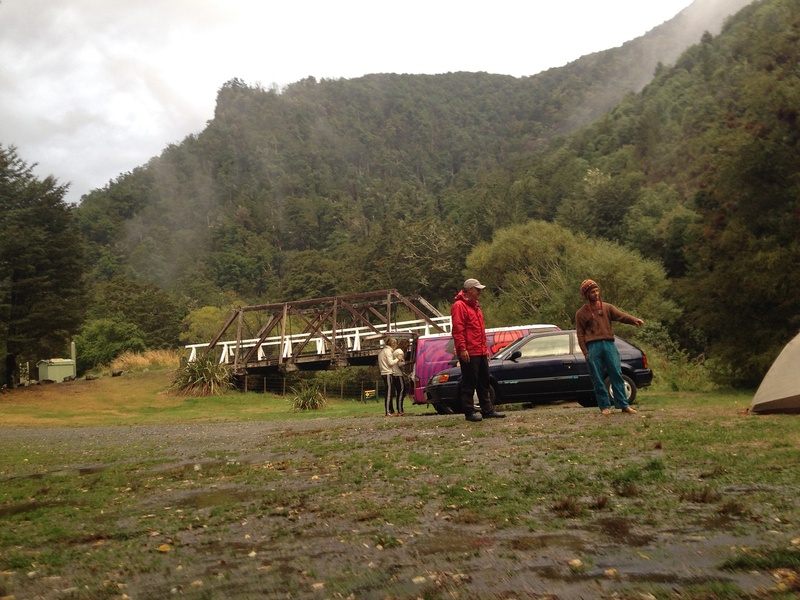 We had a most O is for Awesome ride through the Buller Gorge. We decided to spend a little time in Westport on a day off where we happened upon a dog show on the beach. Petting puppies is such a great way to spend the day. 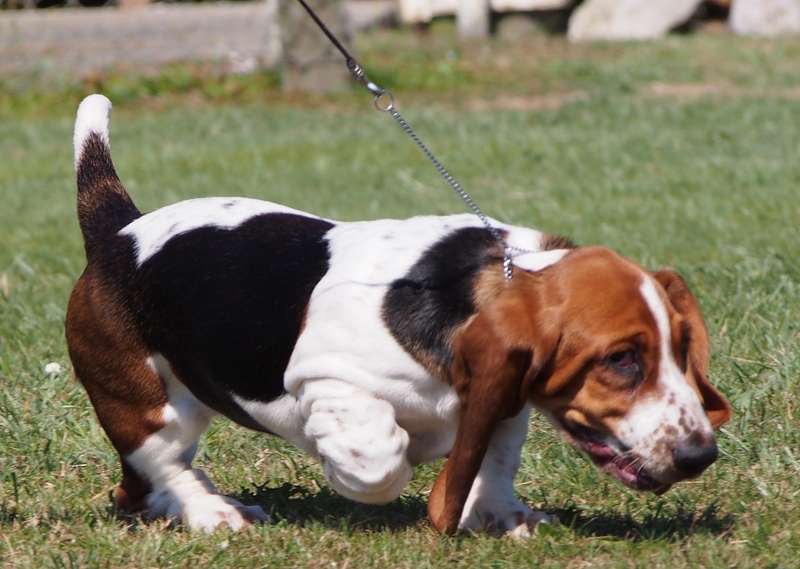 Janet even got to help show the great bassett hound puppy, Skelly, who won best in show for the babies! (He is named Skelly because he has a little skeleton outline on his belly). Skelly- Best in Show for the babies! The lower and upper Buller Gorge are definitely worth the ride. As the river runs east to west and we were headed east, we were on a gradual uphill adventure. With few significant climbs it is, overall, a gentle uphill ride. There are limited places to stay – mostly private backpackers or Department of Conservation (DOC) campgrounds. So it was baths in the icey river for a few days. So worth it. The views and riding were spectacular. Jay, hiding his amusement, “well, it is New Zealand after all, I wouldn’t take a chance.” The sprinkles started slowly and the kids came running back to their tent yelling “the cyclone is coming, the cyclone is coming”. Within seconds they sky opened up and it began dumping, and we mean dumping rain with gale force winds. After diving into our tent, Janet spent the duration of the storm digging a trench with an extra tent stake to stop the water pooling under the tent. 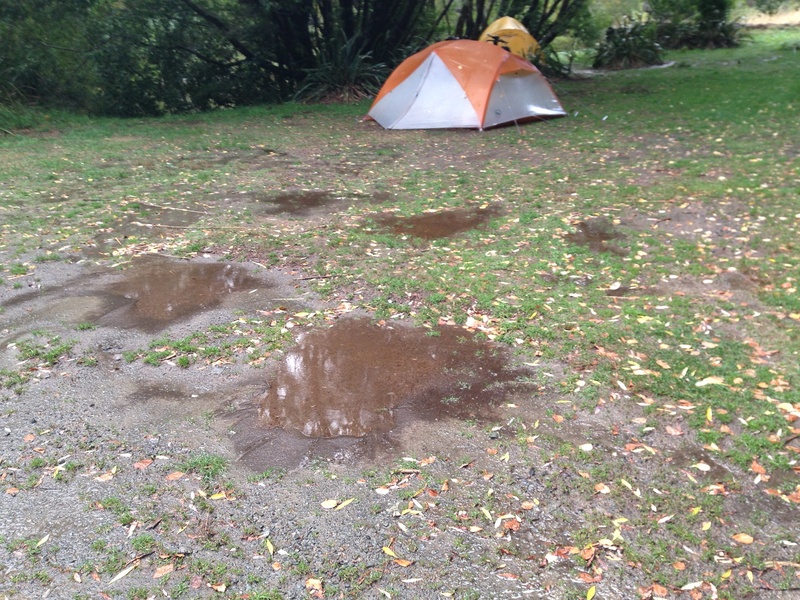 A few minutes after the deluge – the water already drained away- only small puddles remain. Digging trenches with a stake. 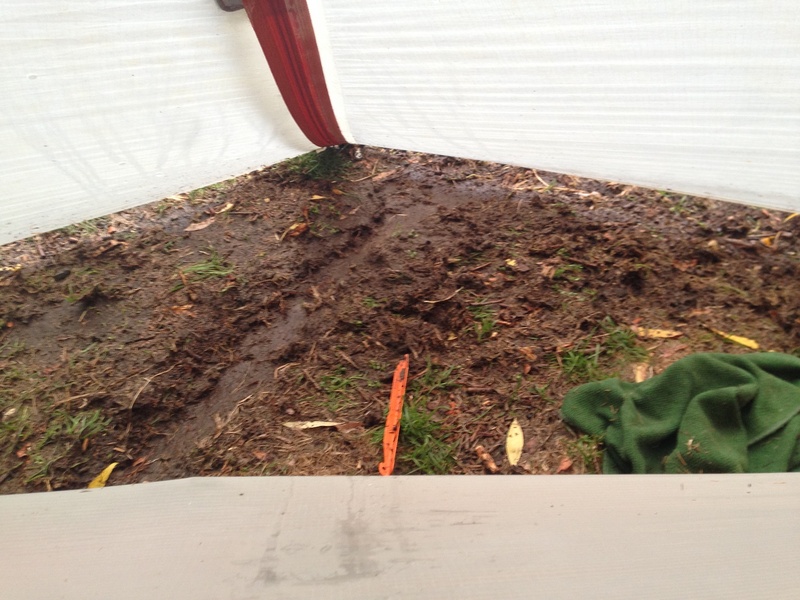 Amazingly, our Big Agnes Copper Spur UL3 tent held up, once again, and we remained dry. 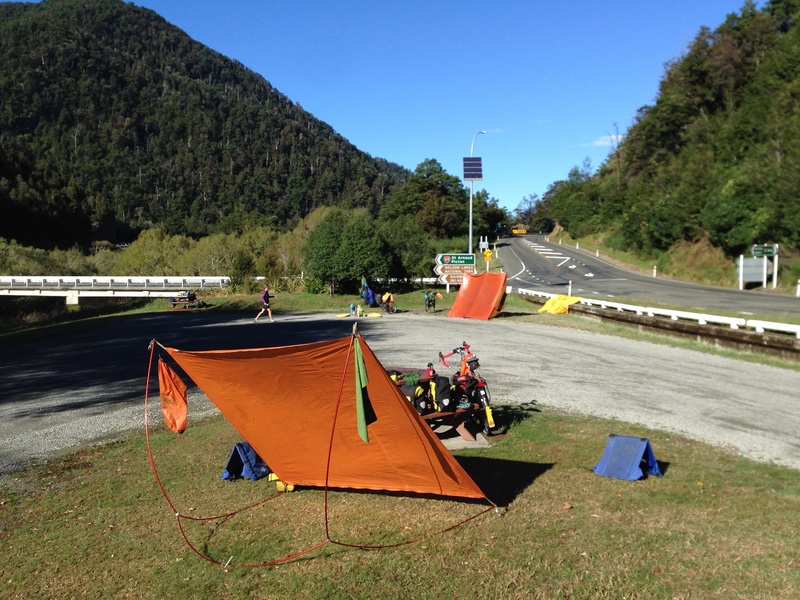 The cycling family also use a Big Agnes tent (a large, four person version) and were perfectly dry. At one point during the deluge, we could hear the kids giggling away in their tent. The two guys in the back opened their camper and all the water which accumulated on the roof went into the van – soaked everything – luckily they were able to laugh about it. Jay in the foreground talking to “the dude” . 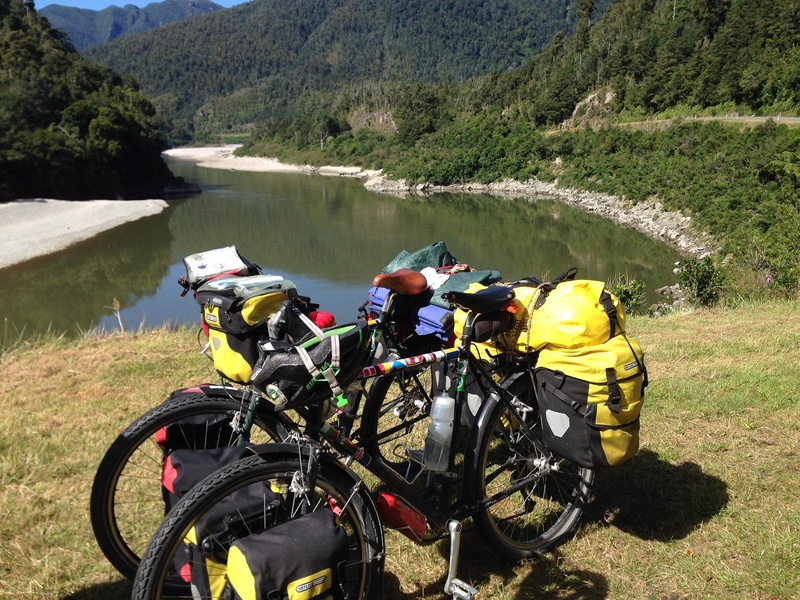 The morning was spectacular and we all dried out our gear before heading north towards the Abel Tasman National Park. Drying out the Big Agnes Tents after a nights deluge – both stayed dry inside! We found a beautiful side track that took us off the main road and away from the logging trucks. 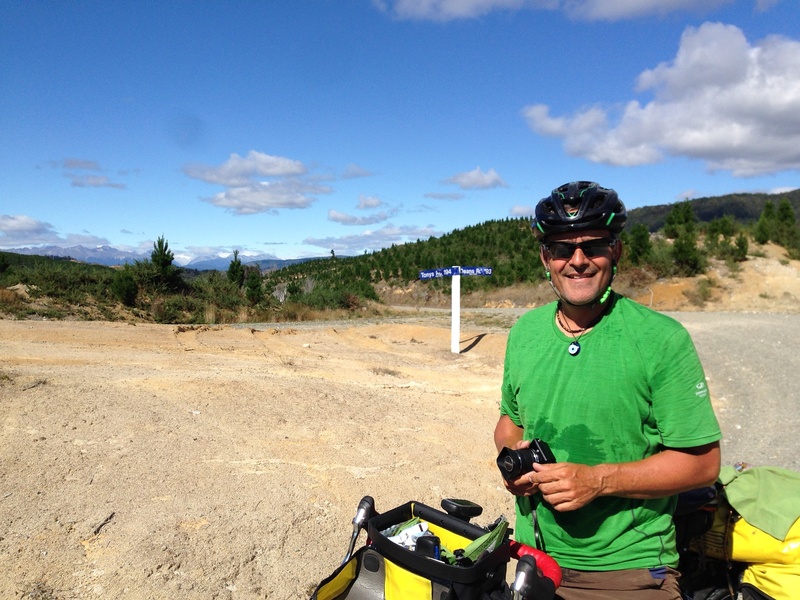 After a short gravel climb we descended for a lovely 30 km into the town of Tapawera where we met Sam and Jess, two fun loving cycling Brits (well, she is from Wales) with whom we leap frogged to Abel Tasman National Park. 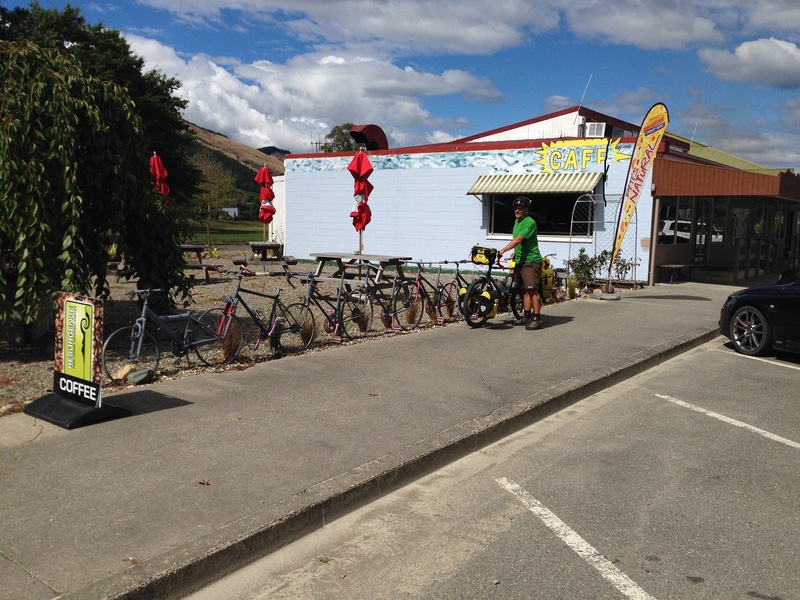 The cool cafe – in Tapawera with the bike fence and yummy food. At the top of our two and half day climb! Ready for the descent.